West Yellowstone is a small Montana town located at the western entrance to Yellowstone National Park. 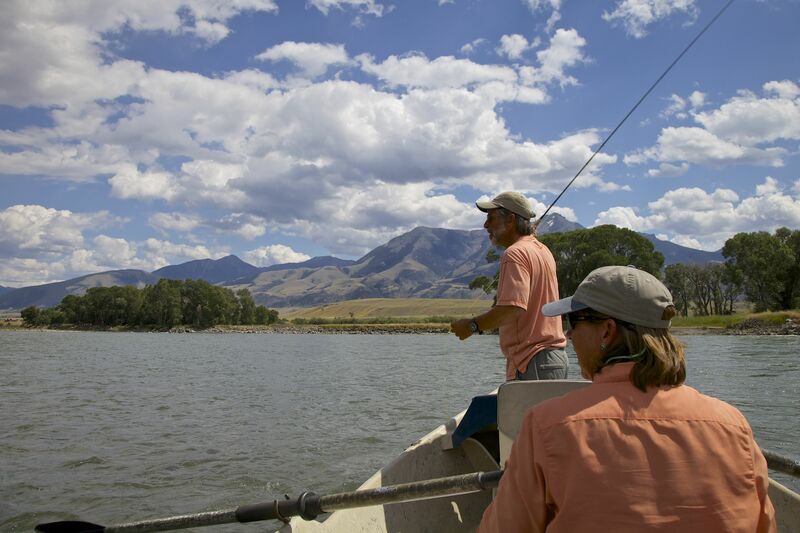 Home to several fly shops, West Yellowstone is strategically situated amongst some of the world’s finest fly fishing. 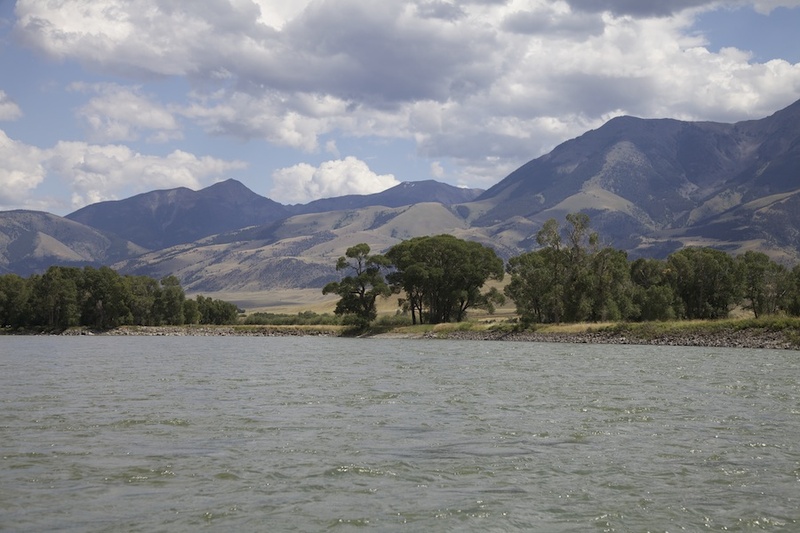 Within a short drive, rivers such as the Madison, Firehole, Yellowstone and Slough Creek beckon, along with Hebgen, Yellowstone and Quake Lakes, waters famous for their ‘gulper’ fishing. Standing beside one of these hallowed waters for the first time is a memory that will live with me for ever. Terrestrials are insects that do not have any aquatic component to their life cycle. 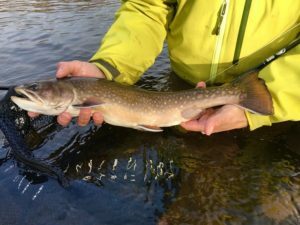 Grasshoppers, ants, beetles, cricket—even bees and wasps form an important dietary component for trout. They become important to fly fishers when they’re present in sufficient numbers and their erratic behaviour results in their being deposited in the water, where opportunistic trout lie in wait. This occurs in late summer for many terrestrial insects, when they’re mature, numerous, and active. Grasshoppers are probably the most well-known due to their large size and leap-first-look-second habits. Beetles are a common occurrence, too, but due to their smaller size and low riding profile, often go unnoticed by anglers. Trout, are much more perceptive, and almost always accept a properly presented beetle pattern. On some of the world’s most selective waters, beetle patterns often shake trout from focused feeding habits, providing an important wild card when hatch density and complexity of aquatic-born insects make fly selection difficult. Ants, which inhabit the trees, woody debris and bushes along river banks, become available in concentrated numbers in the fall as they participate in mating and migration flights. These are my favourite places to prospect using ant patterns. In all cases, a breeze stimulates terrestrial activity, depositing flying ants, beetles and hoppers on the surface of the water. Hoppers land on the water with a less than graceful plop. When they land adjacent to undercut banks the distinct plop draws trout from beneath the bank to investigate. As we worked likely looking areas Bob and I made a point of dropping our hopper patterns within inches of the banks to take advantage of this behaviour, at times dropping the fly right on the edge of the far bank and then pulling it off the bank and into the water, using a strategic strip does a great job mimicking an errant hopper. Once on the water hoppers struggle to escape. Their long hind legs splayed out behind kick and push as they attempt to get back to dry land. Patterns featuring long rubber or stretch floss legs duplicate this trait. In many instances, pattern movement and twitches turn curious trout into confident takers. 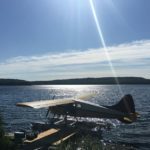 This can be a boon for neophyte fly fishers (who might be struggling with the demanding techniques of match-the-hatch mayfly presentations), as hopper patterns are best presented with heavy landings and pattern movement, which is much less demanding. Grasshoppers often become saturated and drown, their bodies pulled down beneath the surface. In recent years, dead drifting ‘sunk’ hopper patterns often produces fish when traditional floating hopper patterns fail. Hoppers often end up in the water when other fall hatches, such as blue winged olives, are gearing up. These tiny mayflies are both challenging to see and present properly. The hopper-dropper tactic was tailor-made for these events. Attaching a smaller dry, emerger, or nymph pattern in tandem to the bend of the hopper hook, using an improved clinch knot is commonplace on most western streams and rivers. 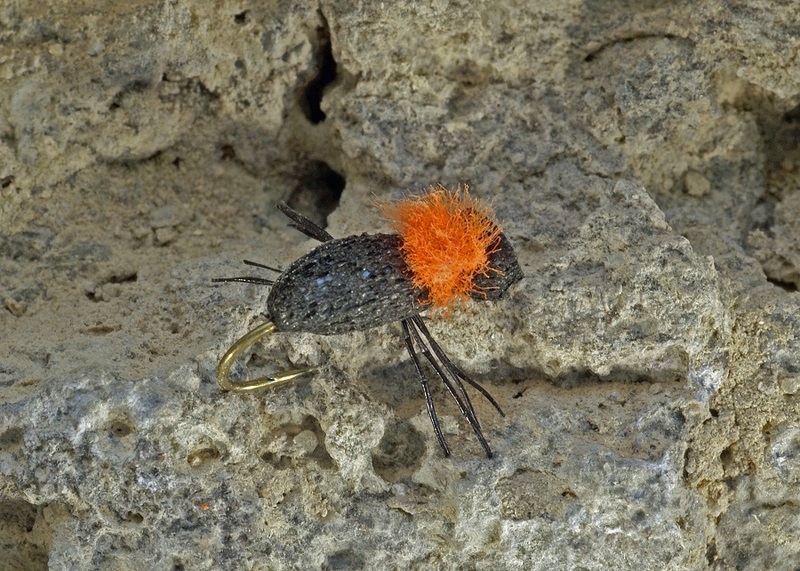 The hopper serves as a natural looking indicator when using nymphs and provides a visible reference for locating smaller dries or emerger patterns. Dropper length varies according to water depth, speed clarity and trout selectivity. Slower moving, clear streams are particularly challenging. A shorter dropper telegraphs the strike more quickly and sensitively than a longer dropper, giving you a better chance of a hook-up. In waters home to both trout and whitefish, a hopper with a small beadhead nymph behind it is lethal. Whitefish love nymphs. Stealth is an important ally when fishing meadow streams. Assume most banks are undercut. Heavy walking transmits vibrations into to the water, announcing your presence and putting feeding fish down in short order. Try to remain back from the banks and walk as softly as possibly. Walk slowly and deliberately. Take your time. Study likely-looking areas. Taking a knee to maintain a low profile pays dividends. On bright sunny days trout may only venture out from the security of an undercut bank for a short period to feed before retreating to their sanctuary. Deeper runs with dark bottoms should also be explored thoroughly on bright days. If possible try to work upstream to take advantage of the trout’s reduced ability to see behind it. Upstream casts are also easier to control and manipulate for natural drag free drifts. 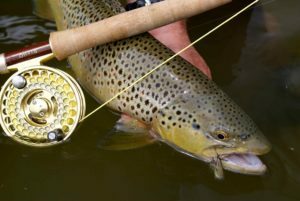 When we first come on a section of the river or stream and see fish moving at the surface it is difficult not to give in to the urge to sprint into position and begin casting wildly. Take a deep breath. Gather yourself. Study the rise forms. Not all surface takes are to terrestrial insects. 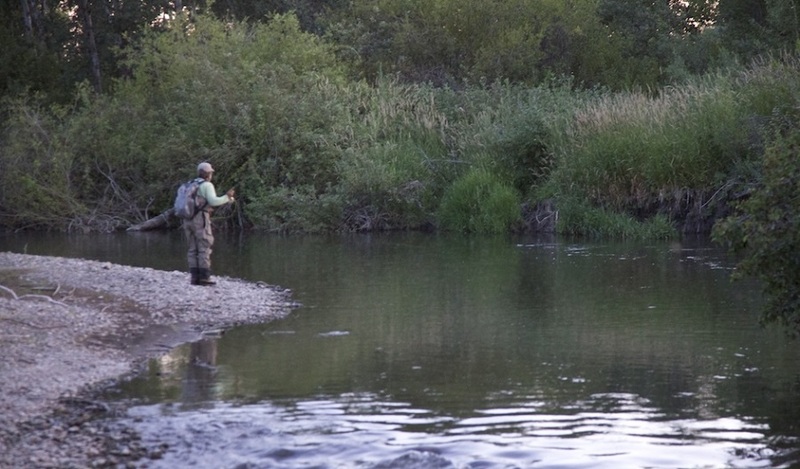 A lazy, bulging rise where only the shoulders and back of the fish are visible indicates trout are taking emerging insects. 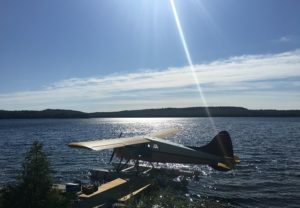 Aggressive splashy takes or rises that leave a distinct bubble in the center are clues that trout are taking something off the surface—this is when a terrestrial pattern should work in late summer or fall. For my terrestrial fly fishing I use the same four and five weight systems I use for the majority of my stream fishing with nymphs and dry flies. I favour long 9’ or 9’6” rods on open rivers and smaller rods on shrouded streams. Longer rods provide greater mending control, but if the day is windy, I’ll use shorter rods. I prefer to make short, controlled, accurate casts, with long taper lines to facilitate gentle presentations. Rio’s Trout LT (Light Taper) line is a personal favourite. If possible, use a short leader for casting accuracy. My terrestrial leaders range from 9-14 feet including tippet, tapered to 4X or 5X. When working to fish on slow moving clear waters longer 14 foot leaders are more appropriate. The separation between fly line and leader for these ‘fine and far’ presentations provides an added element of stealth. I rarely use fluorocarbon when using dries, particularly smaller ones, as it drags them beneath the surface. Wind is a necessary evil when terrestrial fishing. After all, a decent breeze (even though it can make casting more difficult) is needed to get the insects on the water in the first place. Wind rarely works in our favour, dictating an adjustment to your casting techniques. If the wind is in your face, tilt the casting plane down into the wind to enable you to throw tigh,t wind resistant loops. The high backcast rolls out efficiently, and the low front cast allows you to drive the fly into the wind’s teeth. 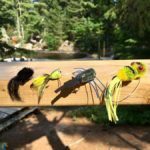 If bank and wind conditions allow, a side arm cast works well, especially if the wind is blowing into your casting shoulder. Side arm casts also work well for casting flies under overhanging trees and grass. Wind coming across your body can be dangerous, as the fly line and fly can be blown into you if you are not careful. First of all, if possible, position yourself so that the wind carries your cast down and away from you. This approach allows you to focus on proper presentation. 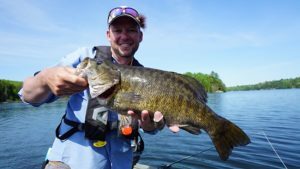 Polarized sunglasses are invaluable for protecting your eyes, as well as for seeing into the water to spot fish and potential wading hazards. 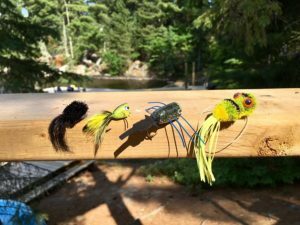 There are number of casting techniques you can use to defeat cross-body wind. During my West Yellowstone stay, Bob Jacklin recommended a Belgian cast. A Belgian cast features a wide, almost side arm, backcast that takes the fly away from you to the side. As you stop the rod and power forward the rod tip is brought to the vertical and powered forward in the traditional manner. Belgian casts also work well for casting large or weighted flies. 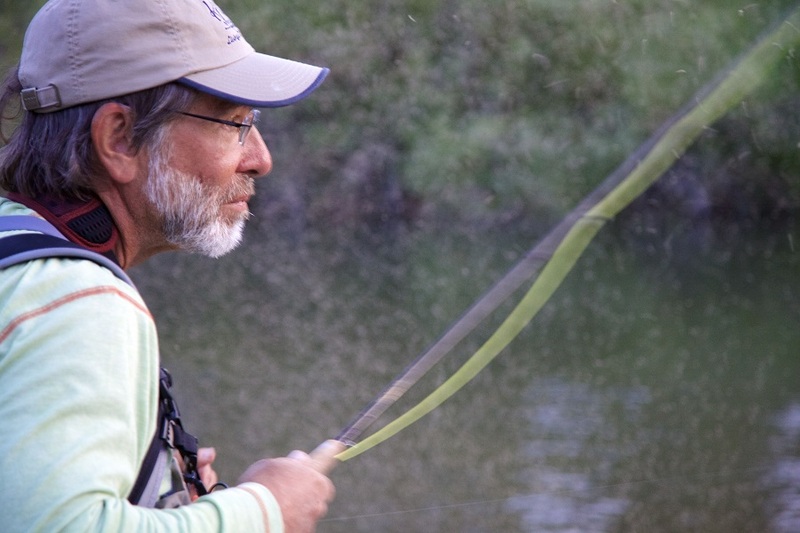 For short distances I often use a cross-body cast, which consists of opening your casting hand slightly and angling the rod so that the tip and fly line pass over your head on the downwind side of your body. The casting hand remains on the same side of your body as it does for a traditional cast. Only the rod angles across your body. Another very useful casting technique for dealing with wind involves learning to cast with your non-dominant hand—a point driven home to me by friend and local guide Dave Jensen when we filmed an episode in central Alberta. 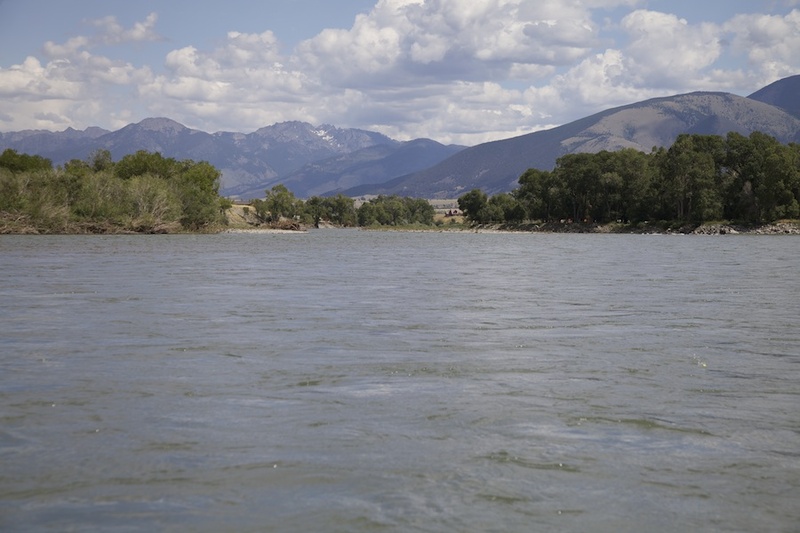 An ambidextrous approach offers other advantages in addition to coping with wind: high banks, shoreline grasses and bushes can be avoided when casting upstream or downstream by simply changing hands. Some casters use a back cast to present flies. I find this method works best on lakes and large waters where accuracy and delicacy are not such an issue. All the above casting techniques demand careful practice in non-fishing situations—trying to figure them under ‘game’ conditions is not recommended. 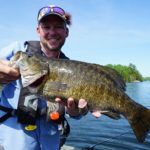 As little as fifteen minutes practice a day can reap healthy rewards on the water. 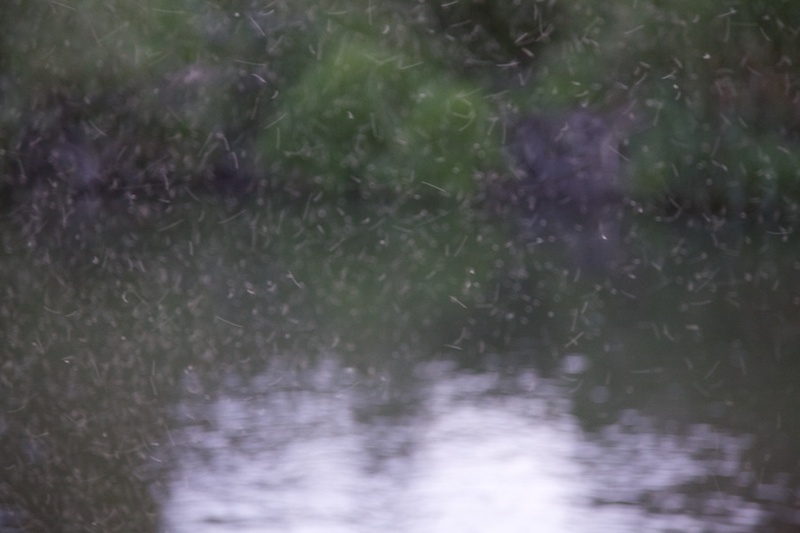 Terrestrial patterns offer some of the finest dry fly opportunities of the season. Even when trout seem fixated on other prey, a well presented terrestrial can provide an almost welcome distraction. Hopper patterns are favourites with many fly fishers, but don’t forget to include some of the smaller terrestrials, such as beetles and ants. If you ever have the good fortune to visit the West Yellowstone area in the fall, make a point of reserving fly box space for a selection of your favourite terrestrials.